Stem-cell transplants may control and even reverse multiple sclerosis symptoms if done early enough, a small study has suggested. Not one of 21 adults with relapsing-remitting MS who had stem cells transplanted from their own bone marrow deteriorated over three years. And 81% improved by at least one point on a scale of neurological disability, The Lancet Neurology reported. Further tests are now planned, and a UK expert called the work "encouraging". MS is an autoimmune disease which affects about 85,000 people in the UK. It is caused by a defect in the body's immune system, which turns in on itself, causing damage to the nerves which can lead to symptoms including blurred vision, loss of balance and paralysis. At first, the condition mostly causes intermittent symptoms that are partly reversible. Over a 10-15 year period after onset, most patients develop secondary-progressive MS, with gradual but irreversible neurological impairment. It is not the first time this treatment - known as autologous non-myeloablative haemopoietic stem-cell transplantation - has been tried in people with MS, but there has not been a great deal of success. 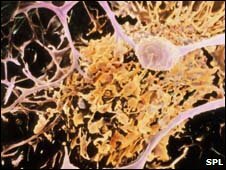 The researchers at Northwestern University School of Medicine in Chicago said most other studies had tried the transplants in people with secondary-progressive MS where the damage had already been done. In the latest trial patients with earlier stage disease who, despite treatment had had two relapses in the past year, were offered the transplant. Stem cells were harvested from the patients and frozen while drugs were given to remove the immune cells or lymphocytes causing the damage. The stem cells were then transplanted back to replenish the immune system - effectively resetting it. Five patients in the study relapsed, but went into remission after receiving other therapy. The researchers are now doing a randomised controlled trial in a larger number of patients to compare the treatment with standard therapy. Study leader Professor Richard Burt said this was the first MS study of any treatment to show reversal of damage. "You don't want to wait until the horse has left the barn before you close the barn door - you want to treat early. "I think the reversal is the brain repairing itself. "Once you're at the progressive stage you have exceeded the ability of the brain to repair itself," he said. However, he cautioned that it was important to wait for the results of the larger trial. And that he would not call it a cure but "changing the natural history of the disease". Dr Doug Brown, research manager at the MS Society, said the results were very encouraging. "It's exciting to see that in this trial not only is progression of disability halted, but damage appears to be reversed. "Stem cells are showing more and more potential in the treatment of MS and the challenge we now face is proving their effectiveness in trials involving large numbers of people."